Vallecito community loading an air curtain burner to remove slash. Wildfires have always occurred throughout Colorado. But since the mid-1990’s fires have become more intense and the fire season has been getting longer. Southwest Colorado began an interagency effort to improve readiness and response to wildfires with the release of Community Wildfire Protection Plans (CWPP's) for the five-county region in May 2002. Then the unthinkable happened. On June 9, 2002, around 1:30 p.m., a small fire started part way up the Missionary Ridge Road, just north of Durango. By nightfall, the fire had burned close to 10,000 acres. And the fire continued to burn for another six weeks before being contained. By then it had burned more than 70,000 acres and destroyed 56 homes and outbuildings. In 2003, Durango Fire & Rescue Authority hosted a Firewise USA workshop. 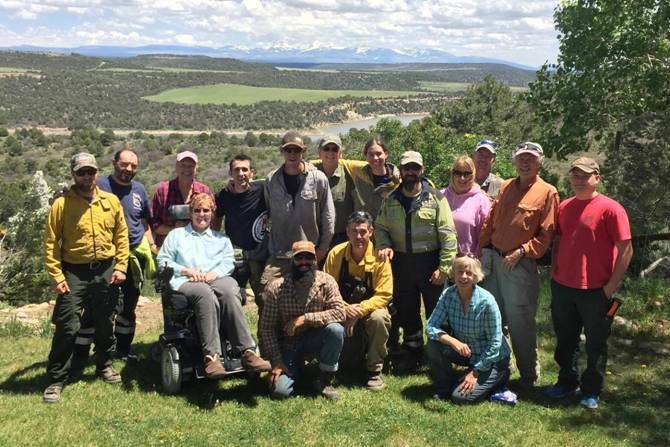 Over 100 residents attended, and out of that workshop, FireWise of Southwest Colorado was born. Though our name has changed, and we are now Wildfire Adapted Partnership, we are the same grassroots organization dedicated to helping homeowners understand their wildfire risk and what they can do to reduce that risk. Today, Wildfire Adapted Partnership has part-time coordinators assisting Archuleta, Dolores, La Plata, Montezuma, and San Juan Counties. We are also proud to have more than 135 Volunteer Neighborhood Ambassadors who are the backbone of our organization. We work closely with a variety of partners including the Colorado State Forest Service (CSFS), United States Forest Service (USFS), Bureau of Land Management (BLM), Offices of Emergency Management (OEM), and local Fire Protection Districts. We are a 501 (c) (3) nonprofit organization.